My husband is from New Zealand, so I’ve had many New Zealand vacations. This was the first one that was both with our kids and in the New Zealand summer. 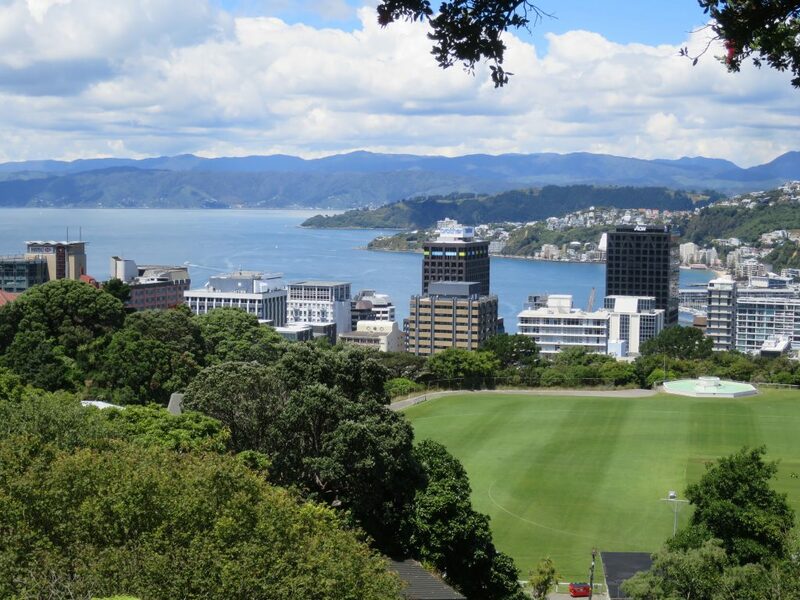 We had some specific goals, such as spending Christmas in Wellington with his family and showing our kids what a traditional New Zealand beach holiday is like, that make this itinerary a little different from what a more typical tourist visit would be like. But I guess we’re not really typical tourists in New Zealand at this point, so that’s OK.
I’m going to split the write-up of this trip into two parts: Our vacation up to and including Waihi Beach, and then our drive from Waihi Beach to Auckland and our last few vacation days in Auckland. I also wrote an “awards show summary” of the trip, which covers what we considered the highlights. We flew into Auckland and then transited to a domestic flight to Wellington. We had scheduled the flights to give us plenty of time for the transit, but our departure from LA was delayed and so in the end we had to power walk between the international and domestic terminal. It was tight, but we made our flight. Our time in Wellington was primarily focused on family. We spent time with my husband’s parents and his sister and her family. There were many visits to playgrounds and family dinners, as well as Christmas. We did do a few touristy things, though. My kids have very fond memories from earlier trips of the playground at the Wellington Botanic Gardens, so we visited again this trip. We parked in town and took the cable car up the hill to the gardens. The view from the top was as gorgeous as we remembered, and the kids had fun on the playground – even if they have almost outgrown the tunnel slide that was so exciting to them on their first visit, the flying fox was still great. We also visited Te Papa. On previous visits, we went because it was an indoor thing to do to get out of the winter rain. On this visit, we went so that my older daughter could take some notes on Maori history and culture for a report she needed to write (to make up for missing a few days of class) and because it is a neat museum. Since it wasn’t rainy, we visited the outdoor section for the first time. I appreciated the information about geology and the fact that we stumbled on a tui up close, singing in a tree. The kids appreciated the big rocks to climb on and the sand pit to jump into and dig in. We also took a trip out to the Wellington suburbs for a visit to the huge playground at Avalon Park. It is a great playground, and it was fun to watch the kids play with their cousins. Afterwards, we drove over to Eastbourne for lunch at the Days Bay Pavillion. The food was not bad, but the real attraction here is the large grassy area for the kids to to run around. 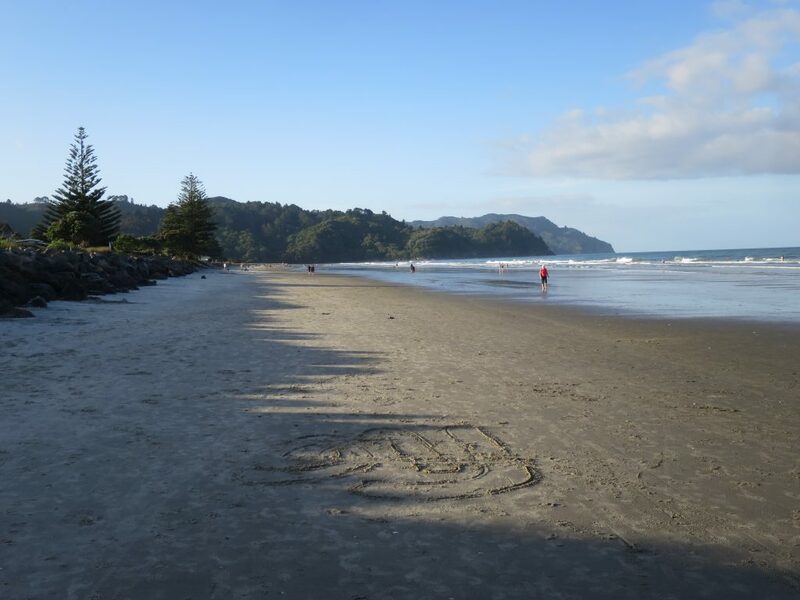 After our Christmas in Wellington, the entire family went to Waihi Beach for a beach holiday. Our little family of four decided to take two days to get there, stopping for a night in Rotorua. The drive from Wellington to Rotorua takes most of the day, so we didn’t do much sightseeing along the way. We did make a couple of playground stops, though. The first was in Levin, and the Levin Adventure Playground is really top-notch. The kids loved it. 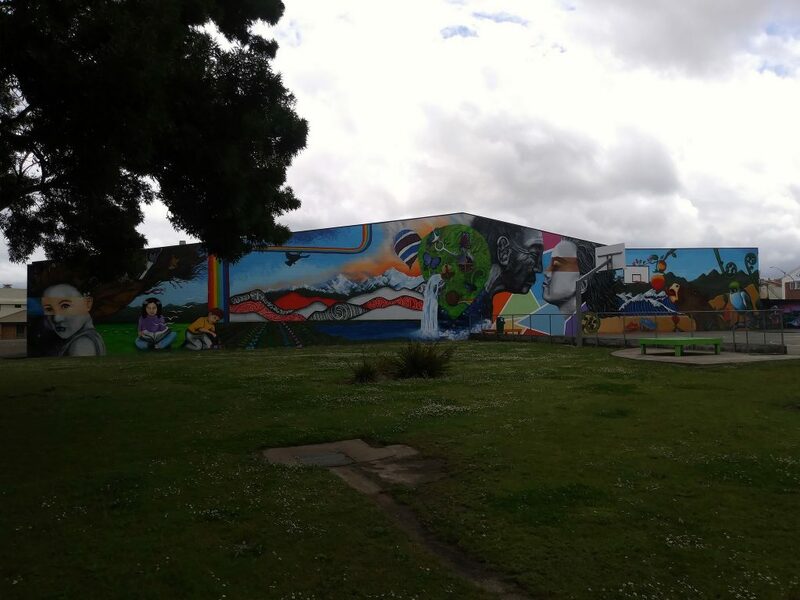 It also has a pretty cool mural. We also stopped in Taupo to stretch our legs. The kids have only vague memories of the visit we made to Taupo on our first trip to New Zealand. We’ll need to go back with them sometime! But this time, we pressed on to Rotorua. We arrived in Rotorua in the late afternoon. We walked down to the lake and then had dinner in the Eat Street section. We picked a brew pub-type place. The food was fine, the beer was good, and the atmosphere was fun. No complaints. After dinner, we drove to Whakarewarewa forest. This would be a great place for some hiking if we’d had more time in Rotorua. There is some native bush, and also a Redwood grove. The latter is a bit strange for a Californian to come across in New Zealand! It was planted as part of some forestry research in the early 1900s. They discovered that Redwoods do grow well in New Zealand, but the wood isn’t as hard as the wood from California-grown Redwoods, because the New Zealand climate is so much wetter. Anyway, we were there in the evening and did not take any hikes. Instead, we went on the Redwood canopy walk. I wished we had time to do it twice: once in the daylight and once at night, but we only did the night walk. 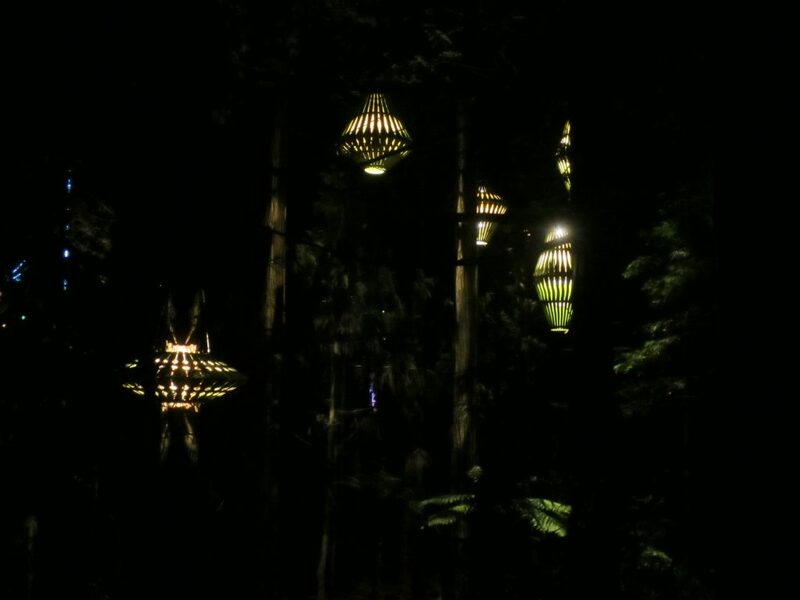 The lights were beautiful and somewhat other-worldly. The next day, we visited Whakarewarewa village, which is a Maori village on a geothermally-active site. We watched the cultural show, and followed part of the tour to hear about how the villagers used to take advantage of their unusual location, and how they still do. And then we left Rotorua and drove on to Waihi Beach. We had nine glorious days at a beach house in Waihi Beach. The beach is long, wide, and not at all crowded. The water was a little on the cold side for me, but my husband and younger daughter had good time boogie boarding and playing in the waves, and my older daughter had fun build sand cities on the beach with her cousins. We had ice cream every day, and a few rounds of a beach cricket game called “bat down” in the evenings (if you hit the ball, you put the bat down on the ground, and whoever catches the ball rolls it to try to hit the bat. If they hit the bat, they get to take a turn batting). We also took a couple of hikes. 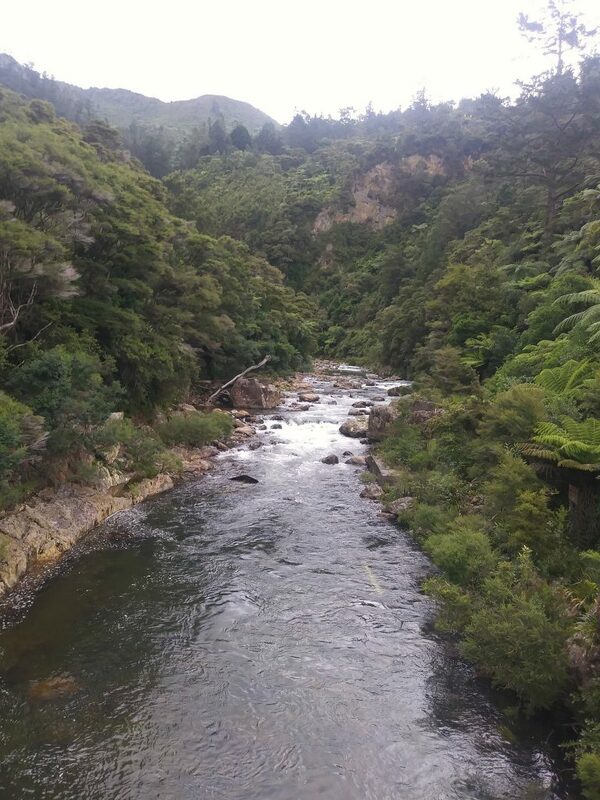 One day, the forecast predicted rain, so we drove out to Karangahake Gorge for a walk along the river and out an old mining train tunnel. The rain never materialized, but walk was fun and we had a wonderful lunch at a cafe in the old Waikino train station afterwards. A view down the gorge from one of the suspension bridges on the hike. Another day, we walked over the northern head on the beach to Orokawa Bay. The walk was nice, providing some great views. And the beach at Orokawa Bay was even emptier than Waihi Beach. It isn’t considered a safe swimming beach, though, so we only let the kids wade. I really enjoyed the walk through the bush and the occasionally views out to the ocean, but I think the kids’ favorite part of the outing was either the tire swing at the start of the walk or the ice cream at the end. 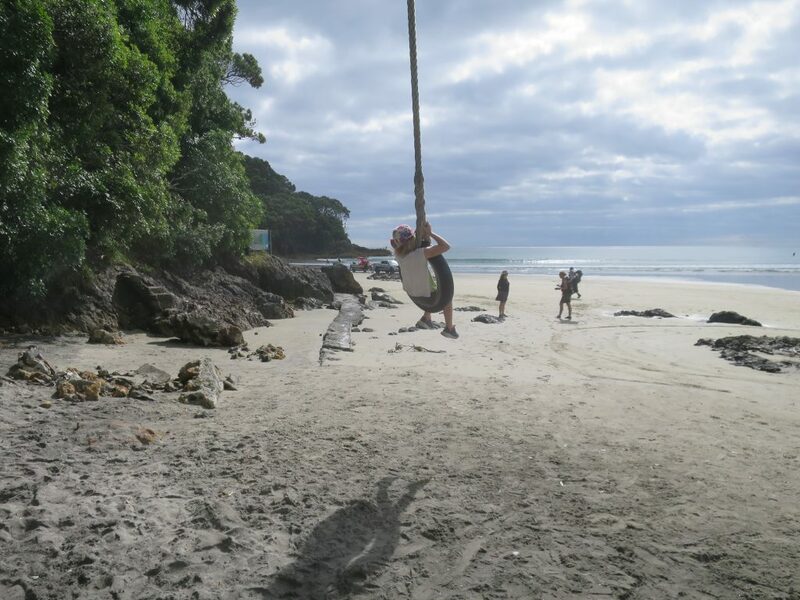 Tire swing on the beach. What could be better? 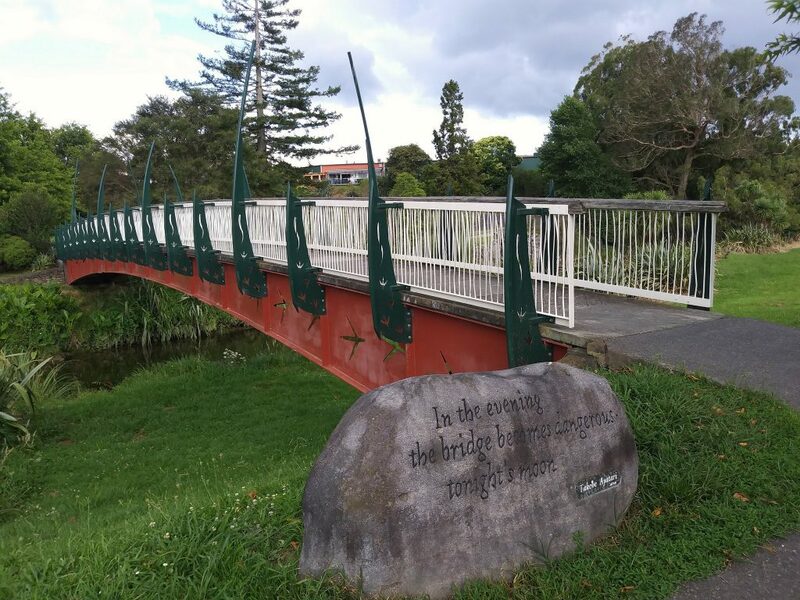 We did a few other things – we drove down to the Bowentown heads and walked up them, we did a little shopping in the small shopping area in Waihi Beach, we visited Katikati to see the bird gardens and the haiku pathway. The Katikati Bird Gardens were nice and the haiku pathway was really cool – a path to walk with haikus carved into walks along the way. And of course we visited some playgrounds. The main attraction was the beach itself, and it did not disappoint. We settled into a regular cadence: beach in the morning, lunch, an outing of some sort (or perhaps back to the beach), ice cream, some rest time, dinner, maybe a visit to the beach for cricket or a walk, and then bedtime. The kids got to see what a New Zealand beach holiday is all about, and the grown ups were well and truly relaxed at the end of it. Trip details: Late December 2018 – early January 2019; Travellers: Me, my husband, and our two kids (ages 9 and 11).